Saints have today announced three new signings for next season. Ryan Olowofela, Lewis Bean and Karl Garside will all be moving to Franklin’s Gardens ahead of the 2019/20 season. 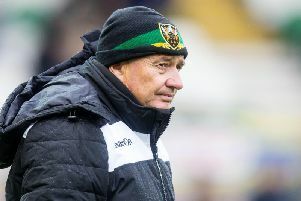 Lock Bean and prop Garside have impressed Saints boss Chris Boyd while appearing as guest players during the Wanderers’ Premiership Rugby Shield campaign. They are already training full-time with the club while continuing to play for Moseley and Ampthill respectively. Meanwhile, winger Olowofela, twin brother of Leicester Tigers full-back Jordan Olowofela, is currently plying his trade on the World Rugby Sevens Series with England and will arrive at Saints in time for pre-season. “Karl caught our eye earlier this season while some of our other tightheads were injured and he took his opportunity superbly. “Lewis has also been really impressive – as you might expect of a serviceman, his work rate and attitude are top class. “Ryan seems to be going from strength to strength with England Sevens so we are really excited to get him into our environment and see what he can do in XVs footy. Olowofela came through Leicester Tigers Academy before turning his attentions to Sevens rugby and the world stage. After making his England debut at the Rugby Europe Grand Prix Sevens Series in Moscow in 2017, the 20-year-old progressed on to the World Series the following year and has been a regular fixture in the side ever since. This season Olowofela has scored 12 tries in 24 matches for England, and he is set to reach 50 Sevens caps overall before the end of the current campaign. Rifleman Bean has been on two tours of Afghanistan during his time in the military services, but also worked his way up through the Army’s age-grade teams and featured in the 100th anniversary match between the Army and Navy at Twickenham in 2017. The 125kg lock has balanced his career while playing for Moseley in National One in recent seasons, also turning out twice already in black, green and gold for the Wanderers this term, against Worcester Cavaliers and Wasps A.
Bean, who is 26, was on loan at Worcester Warriors at the start of the season and featured for the Sixways outfit in the Gallagher Premiership, before landing a switch to Saints. And 21-year-old tighthead Garside began his rugby career at Oaklands College and featured in the RFU’s AASE League against the likes of future Saints team-mate James Grayson. He became Saint number 1997 back in October when he made his full debut against Bristol Bears in the Premiership Rugby Cup, and has four first-team appearances to his name so far, including featuring in the Premiership triumph over Wasps at Franklin’s Gardens. At club level Garside joined National One outfit Ampthill & District from Old Albanians in 2017, and has also represented Hertfordshire and England Counties.